Wilshire Boulevard and Fairfax Avenue, two real Los Angeles thoroughfares, get mentioned a lot here at Wilfair HQ. It's the real intersection where the fictional Wilfair Hotel and Motel Fairwil sit, and the title springs from the intersection's combined name. But I've never spoken about the third street that abuts the property -- wait, did you just tee-hee because I typed "abuts?" -- me too, a little -- and it is now time. 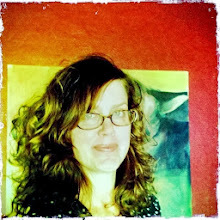 Partly because there is some interest in theme colors of the books (hi, Nikki) and partly because I happened to just be there. Yep, the third street in the Wilfair-Fairwil nexus is the not-so-shockingly named Orange Street. 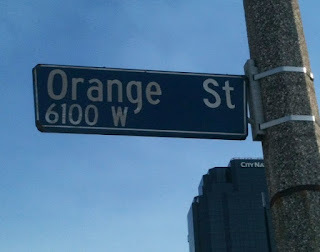 Orange is Wilfair's designated hue, from its cover to its cinnamon-lit lobby to its citrus topiaries. And because my camera was out, I snapped three more random pics right in that area. 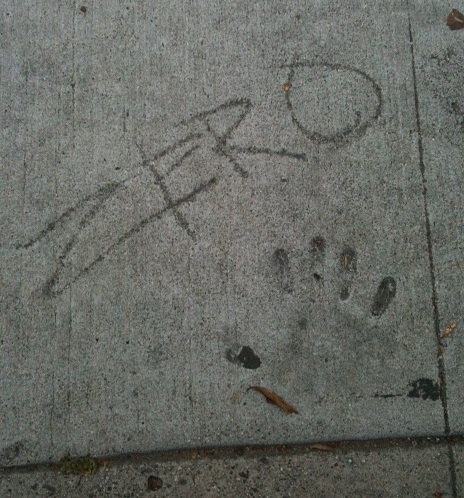 Zero happened to be written on the sidewalk near the not-there hotel and motel. It's Fair Finley's new favorite number, from "Redwoodian," but who wrote it in the cement? Fair or Gomery? I hope neither, because they should behave. 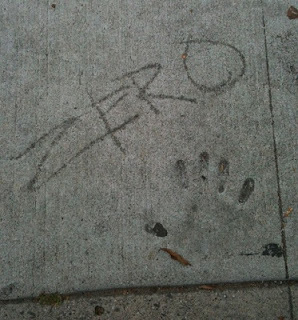 Or at least they should misbehave in all the bolder, more interesting ways, which don't include writing in wet cement. Maybe wet windows. This art was for sale at the antique store around the corner from The Wilfair and the Fairwil. A vintage-looking lady, a city, and an expression of gratitude? Why yes, it IS going on the Wilfair blog! And then this. 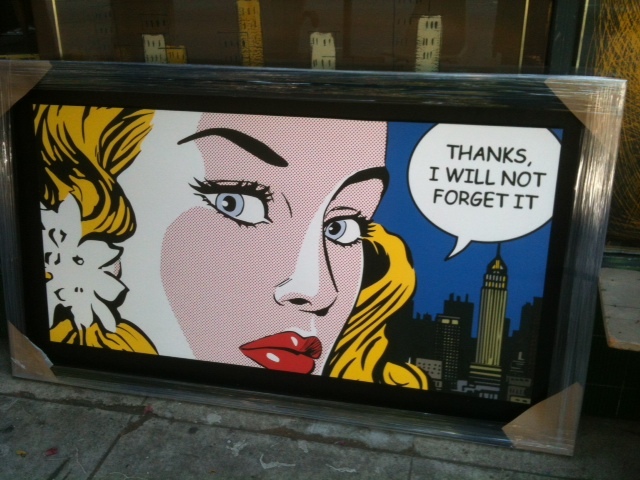 This was for sale next to the art. There are no words. I kind of want it. Let me also stress that it was absolutely huge, too. A huge, one-eye-blinky bird. There is no book tie-in for it, sadly. Hmm. Monty Overbove might purchase it, pose it on a pool lounger, and wait for guests to ask about. Then he could say he doesn't know what they're talking about. What huge, one-eye-blinky bird? Uh-oh. Now I'm seeing this thing show up in a lot of places that might amuse Monty. The tiny Ferris wheel inside The Wilfair? Yes. The Wilfair's elevator? Yes. Gomery's room? Yes. Monty's room when Gomery gets a hold of it? So much yes. I can see Monty taking blinky bird to visit Sutton at the fruitcher stand but that would probably end up with a cleaver lodged somewhere on the bird. Maybe he could greet some motel Fairwil guests in the van? or give Gomery a good scare when he wakes up to find it looming over him. bess, this post has been up for all of fifteen minutes and my dreams are already coming true. All I wanted was for my ladies to think of new ideas for the blinky bird. I definitely like it traveling the seven blocks to Farmers Market to visit Sutton. The van is perfect, too. Gomery WOULD be scared. And then he'd laugh. And then he'd plot. I don't really want Blinky Bird to go in the tar pits, but it probably will at some point. Messy. It could also end up rolling all by its lonesome on a Wilfair bell cart down Wilshire. I'm getting too much of a chuckle picturing Blinky Bird in the pool and ferris wheel to come up with something better. *deep breath* Okay... how 'bout in the citrus topiary? Or the plants that separate the 500 Dips Bar and the Motel diner? Maybe Fair would steal it and put it in her window, watching down at the motel. There's a shared knowing of looks in that placement, for sure. 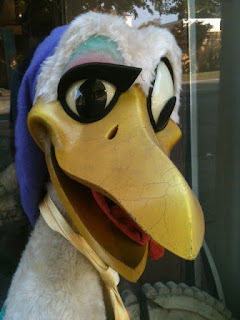 Oh Nicki, I love the idea of the bird in Fair's window keeping a (blinky) eye on the motel! And in the citrus topiary he'd be sort of like a scarecrow. A bird to scare other birds - that's a conundrum. Maybe he can visit the museum across the street and people can mistake him for some sort of installation or performance art piece? Nikki: Blinky-Eye Bird, the scary scarecrow for the citrus topiaries! Ha ha. Yes. There are some gulls that work their way inland to Wilshire and Fairfax. I think one look at B.E.B. and they'd turn on one wing and hightail it back to the Pacific. bess: This bird is SO installation-worthy. One of the many things I love about LACMA is they take chances for a major museum. I've seen some of the weirdest things ever there. Like the walk-in spaghetti forest. 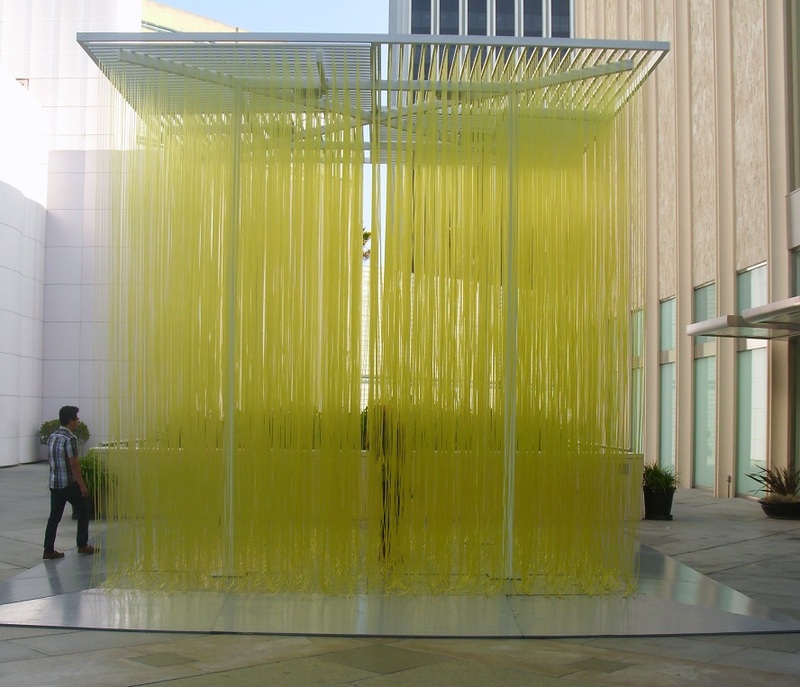 It's actually called Penetrable and the artist is Jesus Rafael Soto. do dah, good point. But maybe B.E.B. was formerly in the collection of Wil and Bo? Maybe Fair donated it to the antique store because it was time for it to move onto a new home. Caitlin #2, that is a perfect reference. I'm going to hang a banner in your honor, in fact, that reads "You're Kidding Me, Caitlin." Good by you?